Do you still get engrossed in the management of papers? Are you tired of signing a lot of documents? KeepSolid one of the top HRM tool brings a world-class solution to make your life easy and hustle free. 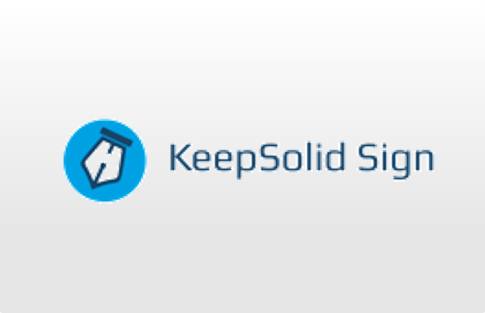 KeepSolid’s Sign is a secure way, allowing you to sign and transfer the documents electronically within no time. With the use of the app, its time to forget the manual process of signing the documents. Avoid the traditional habit of printing and scanning the document and increase your productivity with the tool. Make use of KeepSolid’s Sign tool to sign various documents such as agreements, HR forms, approvals, medical forms, contracts, and much more. The web version of the application is currently in beta version. The users can make exploit the app for free while it is in the beta version. However, the user can make use of all the features in mobile and desktop application for free as of now. The electronic signature makes the process of signing easier and effective. Create your signature on the tool and use it for signing multiple documents as quickly as possible. Moreover, you can also create your initials instead of signatures. View all your documents at a single pace. Also, the tool divides the documents into two: the first is the documents waiting for your signature and second is the documents waiting for others signature. In some of the cases, people often work on standard documents and forms. The templates option of the tool allows saving time in such cases. Through the template option, a user can create or choose a predefined template. Once the template is selected, the user only needs to sign and send the documents. The application is available for mobile platforms such as iOS and Android. The application is available for iOS version 9 and higher and android version 4 and higher. The tool does not with other third-party application. However, it is available for download for MacOS and Windows also. KeepSolid Sign provides support through chat and FAQ options. Furthermore, the users can also contact them through the contact form or email them through support@keepsolid.com. Increased product performance and speed. The web version is currently in beta mode. The beta mode allows only signing and view mode. The high-grade AES-256 encryption incorporated in the tool makes it one of the most secure application, thus, making it stand out from the crowd. Moreover, it also offers offline mode, making it reliable during network issues. For more details, please visit: KeepSolid Sign Website.